Growing up, one of the best things about going Trick or Treating wasn't just the boatloads of candy, it was trying to decide which ones had extra presents in them. I'd tear through packs of Milky Ways and Smarties, Butterfingers and (ick) raisins, trying desperately to find the razor blades and cyanide capsules we'd all heard about. I'd never poison these. That'd be like destroying a Picasso. But I never found any. It turns out nobody actually does that. 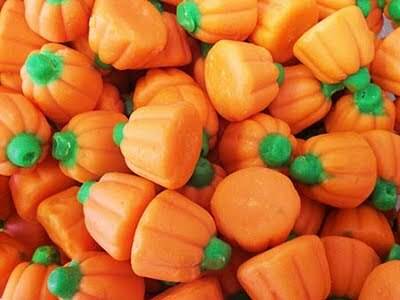 Wikipedia confirms there have been no incidents of deliberately poisoned candy given out from strangers during Halloween. Well, Halloween 2011, we're about to change Wikipedia! It helps that I actually live in an area where kids could foreseeably come Trick-or-Treatin' at my door. This makes the victim procurement pretty simple, and once I figure out how to “enhance” my Halloween food, I am definitely in the Halloween murder business! I realize it's classic to defile apples with various devices of evil, razor blades and the like. But I always found this a stupid practice. I mean by virtue of being fruit, all apples are basically already poisoned anyway. Seriously, who the hell would eat an apple in a world where strangers are giving you boatloads of 100 Grands? With that in mind, I decided to weaponize simple candy. I procured 32 razors, a bag of the best candy multi-pack ever (Crunch, 100 Grand AND Baby Ruth! ), a second bag of candy to remain untainted and edible by me, some of those “Do not eat” packets from beef jerky, Blue Raspberry-flavored Meth, 12 of the “Do not tear off under penalty of law” tags from some extra firm standard sized pillows and a surprising amount of cyanide packets. I usually use a Mach 3 razor to shave my face, so I figured that would be the perfect blade to stash away in a Payday. 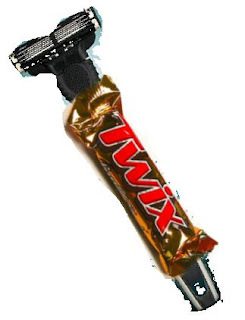 But have you ever tried putting a razor in candy? It's really tough work! A fun size candy bar is not nearly large enough to hold an entire razor and handle. I could go with a full size candy bar, but committing wanton acts of murder with something a corporation has declared “fun” just has such delicious (yum!) irony to it, I needed to use that size. Plus, non-fun size costs upwards of 73 cents per bar. I guess it's true when they say murder don't come cheap. It looks like the cost-prohibitive razors have caused nature to pick my poison for me. When I hatched this whole candy-defiling idea, it got the attention of the FBI. They stormed my compound in a vaguely Ruby Ridge-esque fashion, but their guns and millions of dollars were no match for my crapload of razors. And the great thing about federal agents, their teeth are cyanide capsules. This is so if they're caught by the enemy, they can bite down on their tooth and not reveal state secrets. It makes it a scary endeavor to chew gum or encounter me though. As a result of this bungled raid, I ended up with enough cyanide capsules to show off a full toothy smile. But I didn't put their teeth in my mouth, because, ew. When Ronald Clark O'Bryan poisoned his kids with cyanide Pixy Stix, most of the group actually turned down the candy, because it was wet. I don't know if cyanide is naturally wet, since I've only seen it in tooth form, but this seems like it would definitely present a problem for my scheme. I suppose if I put one of those “Do not eat” silica packets from beef jerky, it might absorb the moisture and will not be abnormally wet. But then again, it's also telling them to not eat my poisoned candy. If that's not a catch-22, I don't know what is! Maybe I could... no, that would work. Or possib... no. What if I dressed as a really neat thing, like a Power Ranger or Darkwing Duck. I could then tell them only cool kids mainline cyanide? That could work, but getting a supply of sterile needles for that would be too time consuming. Oh rats, Idon't know what to do. I'm going to have to apologize, it's just too hard to murder random trick-or-treaters. Sure, I have motive—they keep knocking on my door—I'm just far too lazy to actually create a good murderous candy. Screw it, I'm just going to give out copies of Will Ferrell DVDs and Will Ferrell shaped raisins. Killing their souls like this might even be better than doing in their bodies.